I’m always happy to hear story ideas from readers, fellow writers, photographers and videographers. I don’t pay for guest posts on New Peruvian, but I’ll certainly link back to your website and/or any social media profiles that you have. Anything and everything related to Peru: culture, food and drink, tourist attractions, travel tips, strange experiences — as long as they’re about Peru in some way, I’m happy to hear the idea. It’s Peru travel writing in its broadest sense, although traditional narrative travel writing about Peru is perfect, too. The most important consideration for me is authenticity and authority. I want guest contributors who genuinely know about their subject(s) — or have at the very least actually been to/experienced the place or thing they want to write about. Guest posts I’m particularly interested in are those that offer a different perspective from mine. I’m a white male from the UK. So, for example, Peru travel tips for women by women are perfect. Or traveling in Peru as a member of the LGBT+ community. Or with a disability. Or as an Asian or Muslim or African-American — you get the idea. My categories are flexible, my word counts too (but ideally at least 300 words, better 600+). Photographers can post a photo story with text if they like, or with none. Feature articles are for more personal experiences and interviews (and stuff like that). The other categories are self-explanatory. 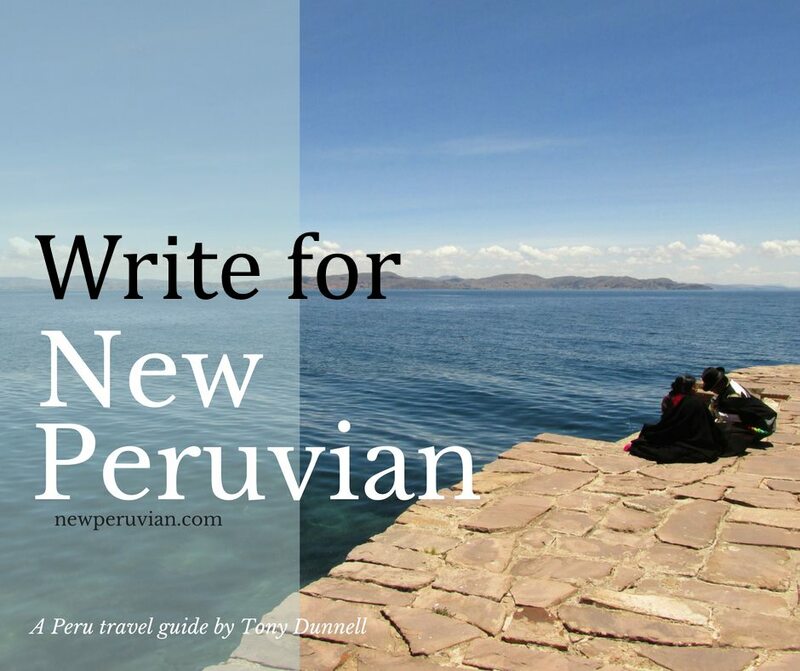 If you want to write about Peru, you can contact me with story ideas through the contact page or through the New Peruvian Facebook page. I’m not interested in purely promotional posts. Sure, you can write about anticuchos in Lima and then link to your own anticucho restaurant in your bio (at the end of the article). But if you’re the owner of “Cerro de Pasco High on Love Hotel” and you want to write about how great “Cerro de Pasco High on Love Hotel” truly is, then I’m unlikely to accept your pitch. Also, please don’t send me pitches about “28 Awesome Things to Do in Bombay in Your Twenties” or “Middle Seat or Aisle Seat: Which Is Best.” If you’re not going to write about Peru, it’s unlikely to work on New Peruvian. It’s unlikely that I’ll accept posts that have been previously posted elsewhere. Please let me know if that’s the case and I’ll give it some thought.